I thought it was about time I had another WIP thread so I've started on a new extensive shader product called Let's Renovate! 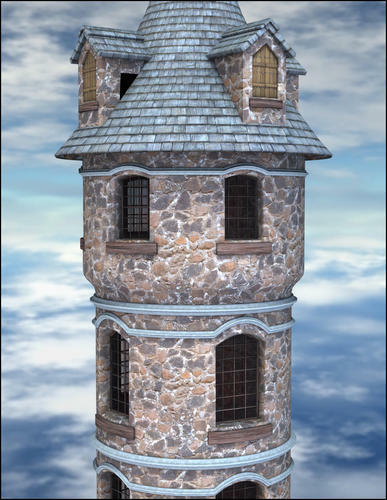 Basically, it will be a big collection of quality external prop textures - building and ground materials - that will allow you so breathe new life into your old prop sets, and even put disparate pieces together to create your own sets to fit your needs. It's a kind of Fabricator for buildings. I've just done the first ten or so textures and tried some of them out on the first prop I found in my runtime that had both ground and walls. 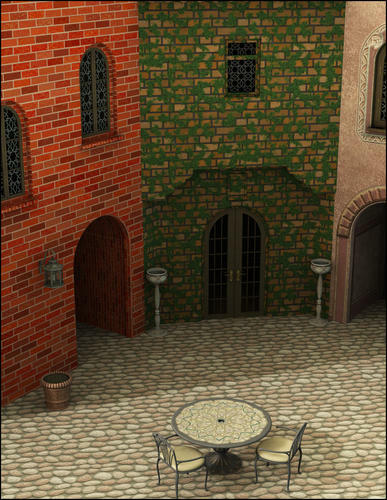 It's an old set called The Courtyard. 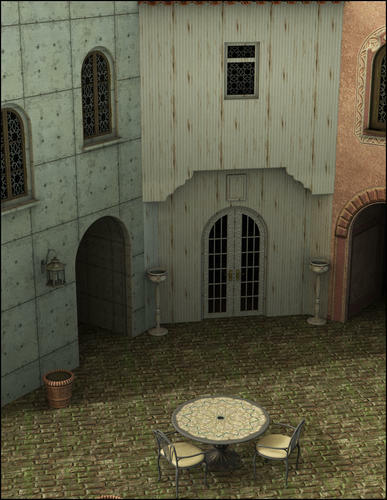 The pink texture you can see on the walls to the right of the image are the original textures. The crazy paving on the ground is from Let's Renovate!, as is the rough brick and the medieval timbered texture in the centre. So let me know what you think and make your building texture requests here. I plan to include roof textures such as tiles, thatching and corrugated iron and there'll be lots of worn and grungy textures as well as some new ones. Maybe windows as well, including broken ones. I'm very pleased you think so! Here's another example. Cobblestones, peeling weatherboards and damaged concrete. These will be of much higher resolution than the original textures, as a rule. 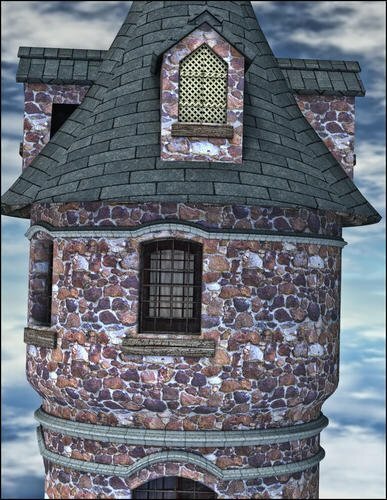 Looks very much like this is going to be another "must have" Marieah texturing set! wow, fantastic idea! funny, i was wishing for something like this just the other day... can't wait! Thanks. It's actually working even better than I'd hoped, and I'm really enjoying putting it together. It's amazing how you can totally change the vibe of a set. Of course, one does lose any extra detail that's on the texture map, but I'm trying to compensate for this with interesting, quality textures. I've done some of this myself in a limited way but I tend not to reuse the work, and while it does lose the texture details that were originally there usually if you are retexturing the scene it's ok. You were retexturing it to change stuff up :) Most of my environments are just backdrops and not the focal point of the scene so I don't see it as an issue for me. I'm very excited about this. It's looking fantastic already. I'd love to see some wood-grained textures, not just paneling, but also for wooden beams. And I'd absolutely love some textures that would be great to put on a castle wall. (Stones of different sizes, if that's possible.) 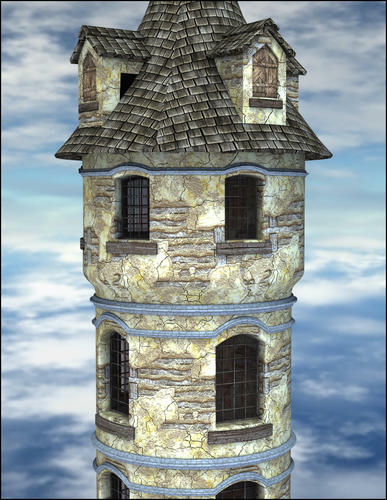 And just to ask for the whole world in one product...a set of textures that would go well with mideval structures/fantasy castles/churches/hovels/cottages. You mentioned roof thatching, so it sounds like that's already an area you're developing. Yeah I think that there could certainly be fabricator like theme packs. Like a fairly wide reaching "generic" pack, an asian themed pack, fantasy etc. Funny while I have a bunch of fabricator packs I mostly use silkessence. There'll be plenty of suitable wood, don't worry on that score. I'm naturally attracted to the worn and the grungy, so expect these kinds of textures to dominate over the clean and sharp. If you look at the first render I published here, you'll see that one of the basic Medieval type textures is already covered and there will be more. The textures are tiled by between 6 and 10 so that limits the variation. 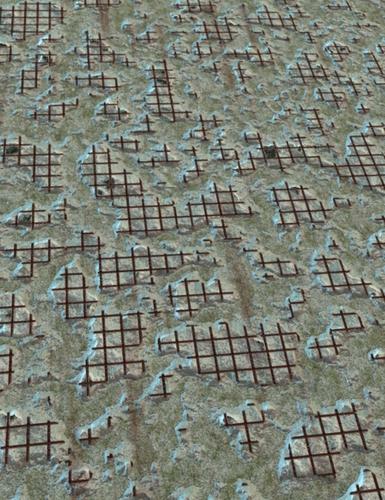 Some of the textures I'm using for ground paving in the images would also work for stone walls. The limitation on this one is that it is exterior textures only. I'm so pleased the idea is going down well. A board & batten texture would be nice. Woohoo! Glad to see this project starting back up. I'll try to see if I can find reference pictures but insulated concrete forms would be nice. I'm not sure what this is. Please show me an example. 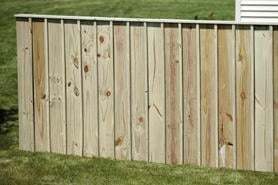 The picture is of a fence; but the concept is the same for walls. My only concern is that the damaged concrete shows a perceptible pattern. But other than having really huge tiles, the only way I can think of to get around this involves layers or procedural shaders, which would interfere with the preview. It looks like she's using variation 7 of Carl's concrete, if she upped the overall size of the tile that filter forge kicks out to 2000px or 3000px (up from the 600px preview tile from the filterforge website that it looks like she's using now) she'd lose a lot of the repetition. And I wouldn't think of that as being "really huge", most Vicky maps are 4000px. Yes, Ziggy, the terracotta roof tiles are already done, along with thatching, corrugated iron, wooden shingles and a few others. I'll post more previews later today. The ivy may be a little bright. I was concerned about the darkening effect of heavy displacement and may have over-compensated. But then again, it may be the lighting. Yes, Joe, I'm using Filter Forge to generate the color maps for the first batch of these so that is indeed the concrete. I'm then making my own displacement/bump/normal, spec and reflection maps to make them really pop in 3d. The second batch will come from texture resources I own and can make my own tiles from, and the third batch will be from photos I take of building materials. I'm doing a first draft of all the textures first, all at 600 by 600. When I'm done, I'll go back to the ones that are not quite working and generate bigger tiles and use smaller tiling rates. 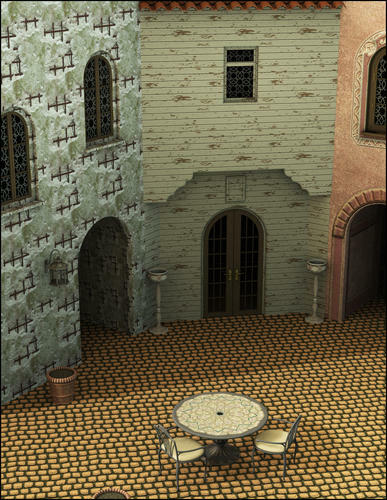 My plan is to allow this set to be used as a merchant resource, provided the textures are baked onto a map or a model and not redistributed as tiles. This could be a great boon for modellers, who could apply the texture in DS, then use Shader Baker to generate a mapped version of it. Joe, I go for small size, hi-res as much as possible and use bigger tiles only when absolutely necessary. It's the notion of producing the equivalent of 10,000 by 10,000 with a single 600 by 600 tile that makes shaders exciting to me. If I had to go up to 4000 to make it work, I'd delete the texture as unsuitable for tiling. Here are a couple more examples. 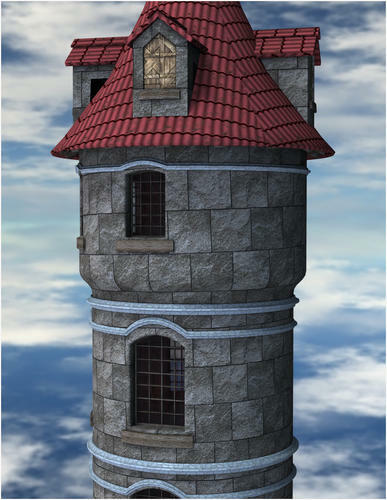 The first is Storm Castle with its original (very nice) textures. The third uses a seamless stone and terracotta roof tiles. The second uses wattle and daub with a wooden shingle roof. There some other textures changed as well on some of the smaller surfaces. ...wow, a fabricator for buildings. Thanks Sikeus. I knew we were on the same page, but had to show you. 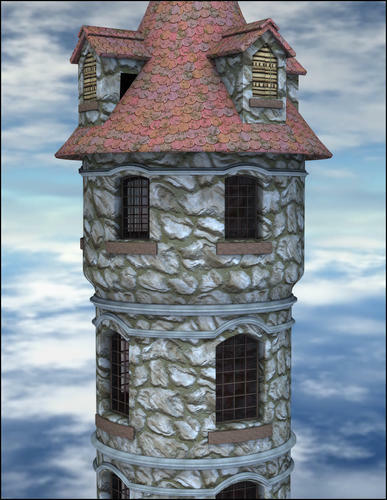 One uses a nice bit of stonework and a rolled roof texture. 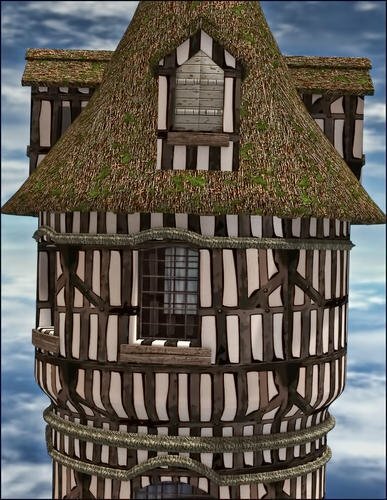 The other is an amusing half-timbered Tudoresque look with mossy thatch for the roof. I've done a couple of kinds of lattice as well, with transparency, and you can see one of them on the upper shutters. Wow these are needed. I need to make buildings look similar to make towns even though the buildings are made by different people. Thank you!